Dubai Motor Tuning Show show is in 2014the Middle East and those of Europe – mostly from Germany – who attended last year’s inaugural edition of this show in Dubai, United Arab Emirates. The 2nd edition of the Middle East Motor & Tuning Show (MEMTS) for custom motorcycles and cars will take place in Sharjah, approx. 3 km from Dubai March 13th to 15th. 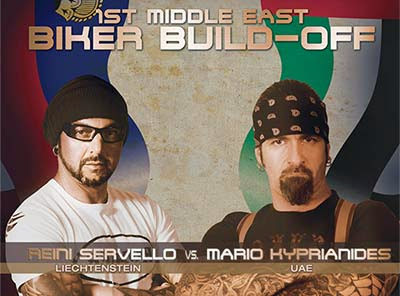 For the 1st time, a biker live “Build-Off” competition opposing Reini Servello of Bobber Garage in Liechtenstein against multi-show winner (Sturgis, Daytona, Faak) Mario Kyprianides of Abu Dhabi-based Chopper Kulture. Both teams have signed international top airbrush artists Austrian Markus Pfeil of Pfeil Design and German Danny Schramm who will perform live artwork front of the crowd. Specialist workshop equipment manufacturer Marolo Test has introduced a new version of its respected ModuLift, specified for the Harley-Davidson Tri Glide. 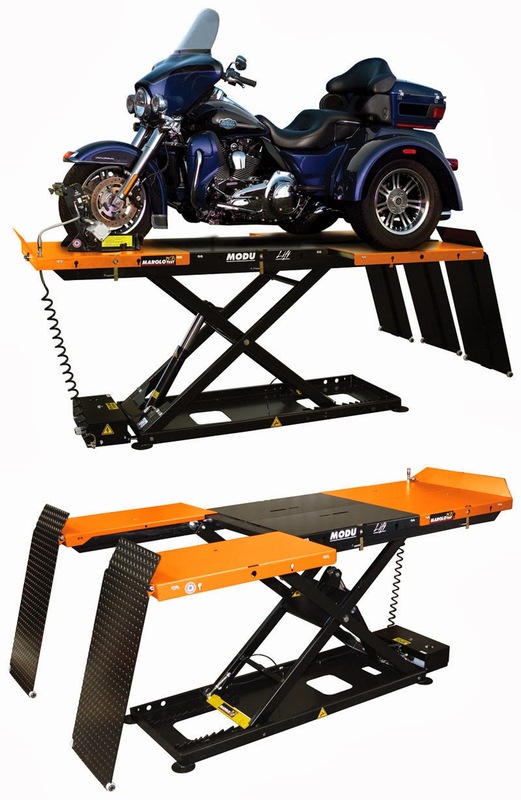 Based on the company's patented modular lift platform, this new version of an established top seller builds on the success that the company has had with the ATV/Quad version of a lift program that is based around six removable plates for 2-3- or 4-wheel vehicle versatility. Marolo Test first introduced their ModuLift concept in 2005 and manufacture and assemble all the major components in-house and with selected suppliers near their Cholet headquarters near Nantes in western France. Specified to meet or exceed all European and international type approvals and certifications, all Marolo lifts are available in a choice of pneumatic or hydraulic power. "However, 80 percent of our sales are pneumatic because of the ease of use, reliability and cost-effectiveness of pneumatic power", Marolo's International Sales Director Raphael Girard told AMD Magazine when we visited their factory earlier this year. The company was founded in 1958 and is believed to have been the first, or at least is certainly among the very first, to have introduced what we now know as dynamometer technology into the motorcycle industry. Still a leading European manufacturer of dynamometers, these days in conjunction with Daniel Fuchs, the Marolo Test program also includes innovative turnkey workshop solutions and the award-winning MaroloBio solvent-free bacteria based parts cleaning system. Marolo Test have an established importer and distributor network, who will be carrying this new product line in addition to the full range of existing Marolo Test workshop equipment, including their dynamometers. However, the company does have openings for some additional importers/distributors in some countries, and would also be happy to hear from any specialist Harley aftermarket, trike industry, and custom v-twin market specialists.